› Author Affiliations Funding This research was supported by a doctoral Scholarship for David Lyell provided by the HCF (Hospitals Contribution Fund of Australia Limited) Research Foundation. Objective Clinicians using clinical decision support (CDS) to prescribe medications have an obligation to ensure that prescriptions are safe. One option is to verify the safety of prescriptions if there is uncertainty, for example, by using drug references. Supervisory control experiments in aviation and process control have associated errors, with reduced verification arising from overreliance on decision support. However, it is unknown whether this relationship extends to clinical decision-making. 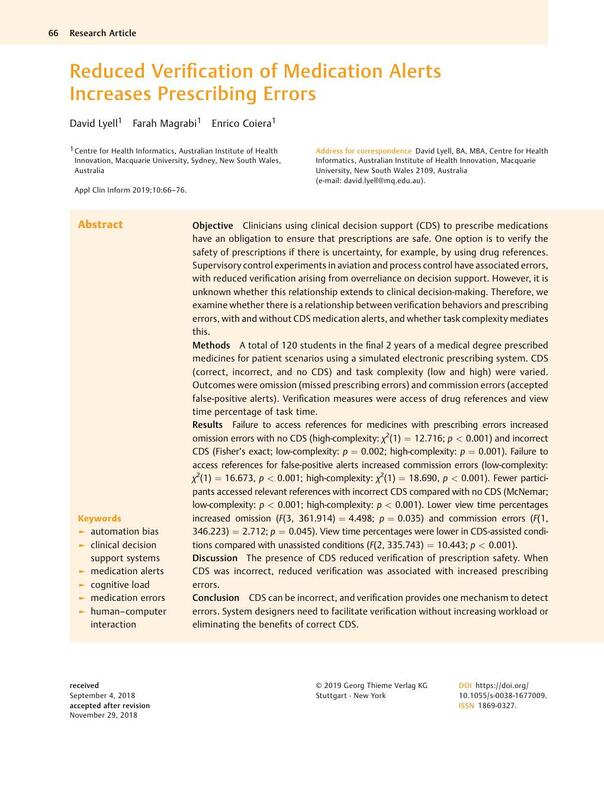 Therefore, we examine whether there is a relationship between verification behaviors and prescribing errors, with and without CDS medication alerts, and whether task complexity mediates this. Methods A total of 120 students in the final 2 years of a medical degree prescribed medicines for patient scenarios using a simulated electronic prescribing system. CDS (correct, incorrect, and no CDS) and task complexity (low and high) were varied. Outcomes were omission (missed prescribing errors) and commission errors (accepted false-positive alerts). Verification measures were access of drug references and view time percentage of task time. Results Failure to access references for medicines with prescribing errors increased omission errors with no CDS (high-complexity: χ 2(1) = 12.716; p < 0.001) and incorrect CDS (Fisher's exact; low-complexity: p = 0.002; high-complexity: p = 0.001). Failure to access references for false-positive alerts increased commission errors (low-complexity: χ 2(1) = 16.673, p < 0.001; high-complexity: χ 2(1) = 18.690, p < 0.001). Fewer participants accessed relevant references with incorrect CDS compared with no CDS (McNemar; low-complexity: p < 0.001; high-complexity: p < 0.001). Lower view time percentages increased omission (F(3, 361.914) = 4.498; p = 0.035) and commission errors (F(1, 346.223) = 2.712; p = 0.045). View time percentages were lower in CDS-assisted conditions compared with unassisted conditions (F(2, 335.743) = 10.443; p < 0.001). Discussion The presence of CDS reduced verification of prescription safety. When CDS was incorrect, reduced verification was associated with increased prescribing errors. Conclusion CDS can be incorrect, and verification provides one mechanism to detect errors. System designers need to facilitate verification without increasing workload or eliminating the benefits of correct CDS. David Lyell conceived this research and designed and conducted the study with guidance from and under the supervision of Enrico Coiera and Farah Magrabi. David Lyell drafted the manuscript with input from all authors. All authors provided revisions for intellectual content and have approved the final manuscript. The research was conducted in accordance with protocols approved by the Macquarie University Human Research Ethics Committee (5201401029) and the University of New South Wales Human Research Ethics Advisory Panel (2014–7-32).